Our first story had to have Daleks in it (what else ? ), filmed using a Panasonic Black & White video surveillance camera. High Tech eh ? The computer graphics were orignally done on an Amiga A500. Doctor Who Sound Effects Tape No.19 got some hammering as well. Featuring a cast of erm, two, and some particularly ropy acting from yours truly. Estimated budget, 3 pence. Took approximately six months to make in total. Not solid 24/7 you undertstand ! Click on the Daleks to the left for more story pictures. 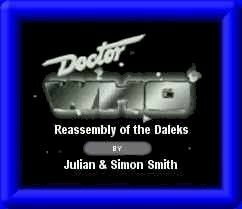 In August 2000 I undertook the introduction of new special effects and refilmed Dalek footage to produce a special edition. New GFX done on a PC/Adobe. Gives a very slight improvement to the overall production !